Rendez-vous Lecture is Rendez-vous français’s book club! Because reading in French is one of the best ways to improve, every month we will select a French book that we will read together before meeting with a nice cup of tea and pastries to talk about it! Anyone can join Rendez-vous Lecture. All you need to do is to buy the book, and contact us to let us know that you’ll join our meeting! You don’t need to take part every month! For our 5th edition, we will read “Une vie”, by Simone Veil. It is accessible from a B1 level. Find more about this autobiography here. You can order it on Amazon or on Book Depository (free delivery worldwide) for example! What if it’s too difficult for me? We make sure to pick books that would suit a B1 student’s skills, with easy enough vocabulary and sentence structures, and that is not too long! Don’t worry at all if you don’t understand every single word: as long as you understand the global meaning of a couple of sentences, keep reading. If you think you missed something important, look up a few words in the dictionary, but not too many so that you don’t need to stop reading all the time. The more you will read in French, the more vocabulary you will get, without even realising it! You’d like to take part, but live too far away? 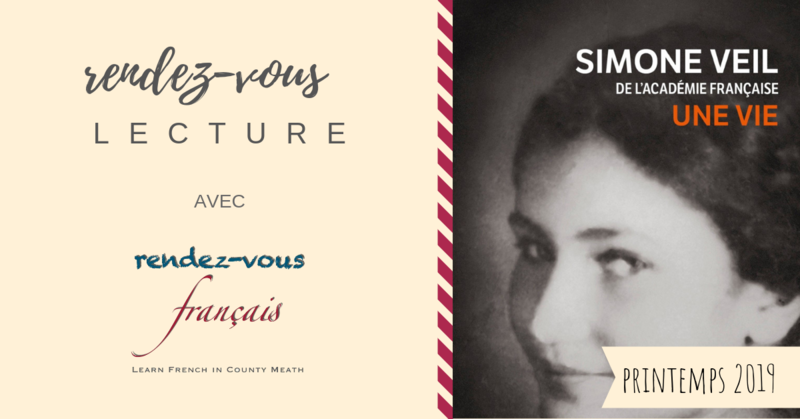 You can always follow @rendezvousfrancais on Instagram or Facebook, and use the #rendezvouslecture on social networks to share with us what you think! The meet up date will be announced at a later stage, it will be in May 2019.